Directions: Follow Univeristy heading towards to mountain. Continue to a junction with Baylor Canyon Road on the left and Dripping Spring Road on the right. 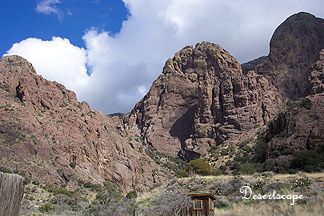 Take the Dripping Spring Road all the way to the parking lot for the visitor center. Dripping Spring was originally built in the 1800’s by Colonel Eugene Van Patten. It was called the “Van Patten’s Mountain Camp”. It had a dozen rooms, a large dining room, and a concert hall. At the turn of century, it attracted many visitors, including such famous characters as Pat Garret and Pancho Villa. Its land and resort was bought by Dr. Nathan Boyd in the early 1900’s, who later sold to Dr. Sexton. During the 40’s, thieves scavenged building materials from the resort. 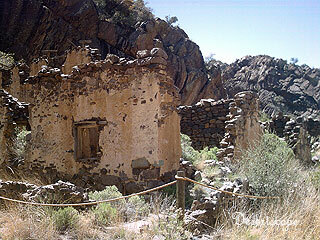 What was left of the resort has become a historical landmark that is part of BLM. We visited Dripping Springs on an overcast Sunday. Between patches of heavy grey clouds, rays of sunlight peeked through and showered the area in a light brilliance. Overall it was pretty nice. The patches of clouds provided some shade from the early spring sun. Once we registered at the front desk and obtained a permit for the car, we started to walk on the steady incline of the thin rocky trail that snakes up among the mountains. Once we get to the middle of the trail, the whole scenery changed. The area between the mountain ridges was a flat ground, giving an impression of that we were still on the bottom of the mountain; the view, however, was spectacular. On one side, the rocky mountain zigzagging toward the sky; on the other, it lay the whole of the central Mesilla Valley, stretching all the way to the horizon. Along the way, we came across several groups of people. Most of which were families with various ages. I guess the trail was easy enough to be a prime spot for family outings. My two year old toddler sat inside the Kelty kid carrier was very content. He looked around with amazement, and firmly declined offers to let him walk. 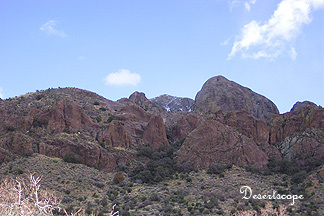 Once we turned toward the valley between few mountain ridges, Cox Ranch was in our view. The wooden houses were rather small in our modern day point of view. But they shared a beautiful view of the valley down below. We read the sign and found it was the place where the livestock had been raised. Upon close inspection, we saw the floorboards of the houses were all gone. Perhaps they are in the restoration process. Through another incline the dripping spring was finally in our view. With a few good rains and snow we just got, the dripping spring was more a small waterfall at this point. Back in the old times, the water from the dripping spring was believed to have healing properties. We turned upward toward the Lodge instead. Located on along the edge of the cliff and overlooking the dripping spring, the lodge was a big wooden house with many small rooms. It was surrounded by bushes and trees. It even has tiny stadium-like seating area under one of the tree. The inside, however, signs of deterioration and the end result of the thievery can be seen in every aspect. Only by looking at its sturdy structure and the prime spot it occupies, can one visualize the luxury and comfort it must have proffered during its prime. From the back of the house, there was a small trail that takes the visitor to the water tanks and the area above dripping spring. For people who are not scared of height, the top of the dripping spring has a rocky ledge that provides a great view of the whole lodge and its surroundings. While we taking in the view, we noticed the sky was quickly darkening. From a distance came the faint sounds of thunder. We packed up our stuff and started to walk down the mountain. We quickened our pace. When we were less than halfway down the mountain, we could clearly seen the rain that was ahead of us quickly moving in our direction. We sped up, hoping to get to the car before the rain get to us. As the cold wind started to pick up the speed, I noticed how cold my little guy’s hands were. Our speed walk turned into a run, as we chased each other down the trail. Just before reaching the 1 mile marker, hail began to fall. I was somehow a little relived to find it was not rain, but at the same time started to worried about my son, who was still recovering from the flu he just recently had. We paused for a moment under a tree. That was just long enough to ascertain that it was not hail at all. Rather, snow that had clumped together into little balls, falling at a much greater speed. We picked up the pace and ran toward the car with speed. Large pieces of icy snow drops hit our faces. We made the last mile in under ten minutes (not bad for carrying a 31 lb. child in a backpack). Our white Mercedes finally crept into view. At this time, I was a bit of relieved and turned to look back at the mountain ridges again. Half covered with a thick veil of clouds, the mountain looked mysterious and forbidding. When we got into the car, the heavy snow had stopped. We drove away slowly as the sky started to clearing up.